For other uses, see Field of Dreams (disambiguation). 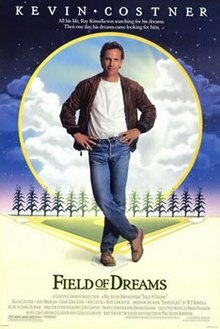 Field of Dreams is a 1989 American fantasy-drama sports film written and directed by Phil Alden Robinson, adapting W. P. Kinsella's novel Shoeless Joe. It stars Kevin Costner, Amy Madigan, James Earl Jones, Ray Liotta and Burt Lancaster in his final film role. It was nominated for three Academy Awards, including for Best Original Score, Best Adapted Screenplay and Best Picture. Ray Kinsella, a novice corn farmer, lives with his wife, Annie, and daughter, Karin, on their Iowa farm. In the opening narration, he discusses his troubled relationship with his late father, John Kinsella, a devoted baseball fan. While walking through his cornfield one evening, he hears a voice whispering, "If you build it, he will come." Ray also sees a vision of a baseball diamond in his field. Annie is skeptical, but agrees to him plowing part of the corn under to build a baseball field, despite the financial repercussions it will cause. As he builds, he tells Karin about the 1919 Black Sox Scandal. Months pass and one night a uniformed man appears on the field who Ray recognizes as Shoeless Joe Jackson, a deceased baseball player his father idolized. Thrilled to play baseball again, Joe asks if others can play there and later returns with the seven additional players who were banned in the 1919 scandal. Ray's brother-in-law, Mark, unable to see the players, warns that Ray will go bankrupt unless the corn is replanted. Meanwhile, Ray hears the voice again, this time urging him to, "ease his pain." Ray and Annie attend a PTA meeting where some local citizens want to ban books by radical author Terence Mann from the school, considering his work obscene. Ray believes the voice he heard was referring to Mann, who had named a character 'John Kinsella' in one of his books. Ray comes across a magazine interview about Mann's childhood dream of playing for the Brooklyn Dodgers. When Ray and Annie both have an identical dream about Ray and Mann attending a baseball game together at Fenway Park, Ray seeks out Mann in Boston. He persuades a reluctant Mann to attend a game with him at Fenway Park. While there, Ray hears the voice urging him to, "go the distance." At the same time, the scoreboard "shows" statistics for a player named Archibald "Moonlight" Graham, who played one game for the New York Giants in 1922, but never had a turn at bat. After the game, Mann admits he heard the voice and also saw the name on the scoreboard. Ray and Mann travel to Chisholm, Minnesota and learn that Graham died sixteen years earlier and was a doctor. During a late-night walk around Chisholm, Ray finds himself back in 1972. He encounters the now-alive and elderly Graham, who states he moved on from baseball for a satisfying medical career. He declines Ray's invitation to fulfill his dream; however, during the drive back home, Ray picks up a young hitchhiker who introduces himself as Archie Graham and says he wants to be a baseball player. While Archie is asleep in the back seat, Ray tells Mann that his father had dreamed of being a baseball star. Ray says he stopped playing catch with his father at age 14 after reading Mann's books about the White Sox scandal. At 17, he caused a rift with his father by claiming that Shoeless Joe was guilty while his father believed him innocent. Ray regrets never reconciling with his father before his death. Arriving back at Ray's farm, they find that more players have arrived to field two teams. A game is played, and Archie finally gets his turn at bat. The next morning, Mark returns and demands that Ray sell the farm. Karin insists there is no need to sell it because people will come and pay to watch the ballgames. Mann agrees, saying that, "people will come," in order to relive their childhood innocence. When Ray again refuses to sell, a scuffle breaks out between him and Mark, during which Karin is accidentally knocked off the bleachers and is unresponsive. The young Graham runs from the field, knowing he is unable to return once leaving, and becomes old Dr. Graham, complete with Gladstone bag, and saves Karin from choking. He reassures Ray that he has no regrets about leaving the field and says his true calling was always medicine. After being commended by the other players, Graham disappears into the corn. Suddenly, Mark can see the players and urges Ray to keep the farm. After the game, Shoeless Joe invites Mann to enter the corn; he accepts and disappears into it. Ray is angry at not being invited, but Shoeless Joe rebukes him: if he really wants a reward for having sacrificed so much, then he should stay on the field. Shoeless Joe then glances towards a player at home plate, saying, "If you build it, he will come." The player removes his catcher's mask to reveal he is Ray's (younger) father. Shocked, Ray realizes that, "ease his pain," referred to his father, and believes that Shoeless Joe was the voice all along; however, Joe implies that, "ease his pain," was about Ray himself. Joe then disappears into the cornfield. Ray introduces John (not calling him "Dad" until later) to Annie and Karin. As John heads towards the cornfield, Ray asks if he wants to play a game of catch. They play as Annie happily watches. Meanwhile, hundreds of cars can be seen approaching the baseball field, fulfilling Karin and Mann's prophecy that people will come to watch baseball. The identity of the actor who provided “The Voice”, who speaks to Ray throughout the film, has remained unconfirmed since the film’s release. It’s been believed by some to belong to film stars Costner or Liotta, while the book’s author W.P. Kinsella stated he was told it was Ed Harris (husband of Madigan). Matt Damon and Ben Affleck were extras in the Fenway Park scene. Phil Alden Robinson read Shoeless Joe in 1981 and liked it so much that he brought it to producers Lawrence Gordon and Charles Gordon. Lawrence Gordon worked for 20th Century Fox, part of the time as its president, and repeatedly mentioned that the book should be adapted into a film. The studio, however, always turned down the suggestion because they felt the project was too esoteric and noncommercial. Meanwhile, Robinson went ahead with his script, frequently consulting W. P. Kinsella, the book's author, for advice on the adaptation. Lawrence Gordon left Fox in 1986 and started pitching the adaptation to other studios. Universal Studios accepted the project in 1987 and hired USC coach Rod Dedeaux as baseball advisor. Dedeaux brought along World Series champion and USC alumnus Don Buford to coach the actors. The film was shot using the novel's title; eventually, an executive decision was made to rename it Field of Dreams. Robinson did not like the idea, saying he loved Shoeless Joe, and that the new title was better suited for one about dreams deferred. Later, Kinsella told Robinson that his originally chosen title for the book had been The Dream Field and that the title Shoeless Joe had been imposed by the publisher. Robinson and the producers did not originally consider Kevin Costner for the part of Ray because they did not think that he would want to follow Bull Durham with another baseball film. He, however, did end up reading the script and became interested in the project, stating that he felt it would be "this generation's It's a Wonderful Life". Since Robinson's directing debut In the Mood had been a commercial failure, Costner also said that he would help him with the production. Amy Madigan, a fan of the book, joined the cast as Ray's wife, Annie. In the book, the writer Ray seeks out is real-life author J.D. Salinger. When Salinger threatened the production with a lawsuit if his name was used, Robinson decided to rewrite the character as reclusive Terence Mann. He wrote with James Earl Jones in mind because he thought it would be fun to see Ray trying to kidnap such a big man. Robinson had originally envisioned Shoeless Joe Jackson as being played by an actor in his 40s, someone who would be older than Costner and who could thereby act as a father surrogate. Ray Liotta did not fit that criterion, but Robinson thought he would be a better fit for the part because he had the "sense of danger" and ambiguity which Robinson wanted in the character. Burt Lancaster had originally turned down the part of Moonlight Graham, but changed his mind after a friend, who was also a baseball fan, told him that he had to work on the film. Filming began on May 25, 1988. The shooting schedule was built around Costner's availability because he would be leaving in August to film Revenge. Except for some weather delays and other time constraints, production rolled six days a week. The interior scenes were the first ones shot because the cornfield planted by the filmmakers was taking too long to grow. Irrigation had to be used to quickly grow the corn to Costner's height. Primary shot locations were in Dubuque County, Iowa; a farm near Dyersville was used for the Kinsella home; an empty warehouse in Dubuque was used to build various interior sets. Galena, Illinois served as Moonlight Graham's Chisholm, Minnesota. One week was spent on location shots in Boston, most notably Fenway Park. Robinson, despite having a sufficient budget as well as the cast and crew he wanted, constantly felt tense and depressed during filming. He felt that he was under too much pressure to create an outstanding film, and that he was not doing justice to the original novel. Lawrence Gordon convinced him that the end product would be effective. During a lunch with the Iowa Chamber of Commerce, Robinson broached his idea of a final scene in which headlights could be seen for miles along the horizon. The Chamber folks replied that it could be done and the shooting of the final scene became a community event. The film crew was hidden on the farm to make sure the aerial shots did not reveal them. Dyersville was then blacked out and local extras drove their vehicles to the field. In order to give the illusion of movement, the drivers were instructed to continuously switch between their low and high beams. Scenes of the Kinsella farm were taken on the property of Don Lansing; some of the baseball field scenes were shot on the neighboring farm of Al Ameskamp. Because the shooting schedule was too short for grass to naturally grow, the experts on sod laying responsible for Dodger Stadium and the Rose Bowl were hired to create the baseball field. Part of the process involved painting the turf green. After shooting, Ameskamp again grew corn on his property; Lansing maintained his as a tourist destination. He did not charge for admission or parking, deriving revenue solely from the souvenir shop. By the film's twentieth anniversary, approximately 65,000 people visited annually. In July, 2010, the farm containing the "Field" was listed as for sale. It was sold on October 31, 2011, to Go The Distance Baseball, LLC, for an undisclosed fee, believed to be around $5.4 million. The character played by Burt Lancaster and Frank Whaley, Archibald "Moonlight" Graham, is based on an actual baseball player with the same name. His character is largely true to life except for a few factual liberties taken for artistic reasons. For instance, the real Graham's lone major league game occurred in June 1905, rather than on the final day of the 1922 season. The real Graham died in 1965, as opposed to 1972 as the film depicts. In the film, Terence Mann interviews a number of people about Graham. The DVD special points out that the facts they gave him were taken from articles written about the real man. Universal scheduled Field of Dreams to open in the U.S. on April 21, 1989. The film debuted in just a few theaters and was gradually released to more screens so that it would have a spot among the summer blockbusters. It ended up playing until December. The film was released in the Philippines by Eastern Films on November 1, 1989. As of June 2017[update], review aggregator Rotten Tomatoes rates the film 86%, based on 58 reviews with an average score of 7.8/10. The consensus states: "Field of Dreams is sentimental, but in the best way; it's a mix of fairy tale, baseball, and family togetherness." Roger Ebert awarded the film a perfect four stars, admiring its ambition: "This is the kind of movie Frank Capra might have directed, and James Stewart might have starred in—a movie about dreams." Field of Dreams was released on DVD on May 4 2010. It was released on Blu-Ray on March 13 2011. It is scheduled to be released on 4K UHD Blu-Ray on May 14 2019. In June 2008, after having polled over 1,500 people in the creative community, AFI revealed its "Ten Top Ten" — the best ten films in ten "classic" American film genres. The film was acknowledged as the sixth best one in the fantasy genre. In 2017, the US Library of Congress selected Field of Dreams as one of its 25 annual additions to the National Film Registry. The announcement quotes film critic Leonard Maltin, who called the film "a story of redemption and faith, in the tradition of the best Hollywood fantasies with moments of pure magic." ^ "Field of Dreams (1989)". IMDb. Retrieved March 19, 2015. ^ Laff at the Movies (April 20, 2012). "Review: "Touchback" Is an Inspiring Drama that Will Make You Smile". Grand Rapids, MI: WOOD-TV. Retrieved August 26, 2013. ^ "'Field of Dreams'". JeffCarneyFilms.com. Retrieved August 26, 2013. ^ "Box Office Information for 'Field of Dreams'". Box Office Mojo. August 26, 2013. ^ a b "2017 National Film Registry Is More Than a 'Field of Dreams'" (Press release). Library of Congress. December 13, 2017. Retrieved July 2, 2018. ^ Easton, Nina J. (April 21, 1989). "Diamonds Are Forever : Director Fields the Lost Hopes of Adolescence". Los Angeles Times. Retrieved March 19, 2015. ^ King, Susan (December 15, 2009). "'Field of Dreams' Screens to Mark 20th Anniversary". Los Angeles Times. ^ Grossfeld, Stan (July 20, 2010). "Living in a Dream World?". The Boston Globe. Retrieved July 20, 2010. ^ Wilson, Greg (October 31, 2011). "'Field of Dreams' Iowa Farm Sold for Millions". Chicago: WMAQ-TV. Retrieved August 1, 2012. ^ "Moonlight Graham". Retrosheet.org. Retrieved June 5, 2010. ^ "Your Dreams Will Come True Today". Manila Standard. Standard Publishing, Inc. November 1, 1989. p. 27. Retrieved January 3, 2019. Due to Insistent Public Demand We're Opening Today! ^ "'Field of Dreams'". Rotten Tomatoes. ^ Ebert, Roger (April 21, 1989). "Field of Dreams Movie Review & Film Summary (1989)". Chicago Sun-Times. Retrieved July 17, 2018. ^ "Field of Dreams DVD Release Date". DVDs Release Dates. Retrieved 2019-03-04. ^ "Field of Dreams - 4K Ultra HD Blu-ray Ultra HD Review | High Def Digest". ultrahd.highdefdigest.com. Retrieved 2019-03-04. ^ "AFI Crowns Top 10 Films in 10 Classic Genres" (Press release). American Film Institute. June 17, 2008. Retrieved June 18, 2008 – via ComingSoon.net. ^ "Top 10 Fantasy". American Film Institute. Archived from the original on June 19, 2008. Retrieved June 18, 2008. ^ "AFI's 100 Years...100 Movies Nominees" (PDF). American Film Institute. Retrieved March 19, 2015. ^ "AFI's 100 Years of Film Scores: Honoring America's Greatest Film Music" (PDF) (Official ballot). American Film Institute. Retrieved March 19, 2015. ^ "AFI's 100 Years...100 Movies" (PDF) (Official ballot) (10th Anniversary ed.). American Film Institute. Retrieved March 19, 2015. Wikimedia Commons has media related to Field of Dreams.